Chocolate! Its the best food ever invented! 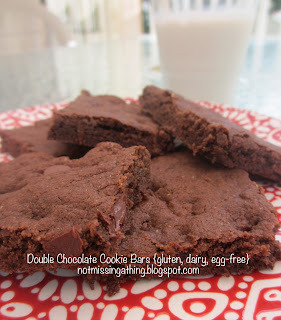 That's why I'm so excited to share with you my Double Chocolate Cookie Bars. These are based on my Chocolate Chip Cookie recipe, with the added benefit of more chocolate (yum!). Good cookies are meant to be shared with friends, which is why its so important (in my opinion) for a food allergic kid to have a good cookie available to eat when everyone else is having cookies. Its even better if said cookie is good enough for food allergic kid to share with her friends and let everyone enjoy them (yeah!). Brings a little bit of normal back to the game. These cookies have no gluten, dairy or eggs in them, but I can't say they are health food. But really, are cookies suppose to be healthy? And just so ya know, these can either be made as bars or as drop cookies - you choose - recipe and cooking times are the same either way. In a large mixing bowl, whisk together dry ingredients (sorghum, starch, xanthan gum, baking soda, salt, flaxseed, and cocoa). In a second mixing bowl, combine brown sugar, shortening, vanilla and applesauce. Cream these wet ingredients together using a hand or stand mixer. Add dry ingredient mixture to wet and beat until well combined. By hand, stir in chocolate chips. Preheat oven to 325. If making cookie bars, spread batter evenly in a large non-stick cookie sheet (mine is 12 inches x 16 inches). The batter will be thick so you'll have to use some finesse to spread it. Bake at 325 for 14 minutes. It may seem a bit underdone, but its not. Just let it cool in the pan before cutting. For cookies, drop rounded tablespoons onto a non-stick cookie sheet. Bake at 325 for 14 minutes. Let cookies cool for a few minutes on the baking sheet, then transfer to a cooling rack. What doesn't get eaten right away, store in an airtight container. Makes about 4 dozen drop cookies. Oh yum! I love making cookies in bar form. It's so much easier. These look delicious. Thanks for sharing them at Gluten-Free Wednesdays. 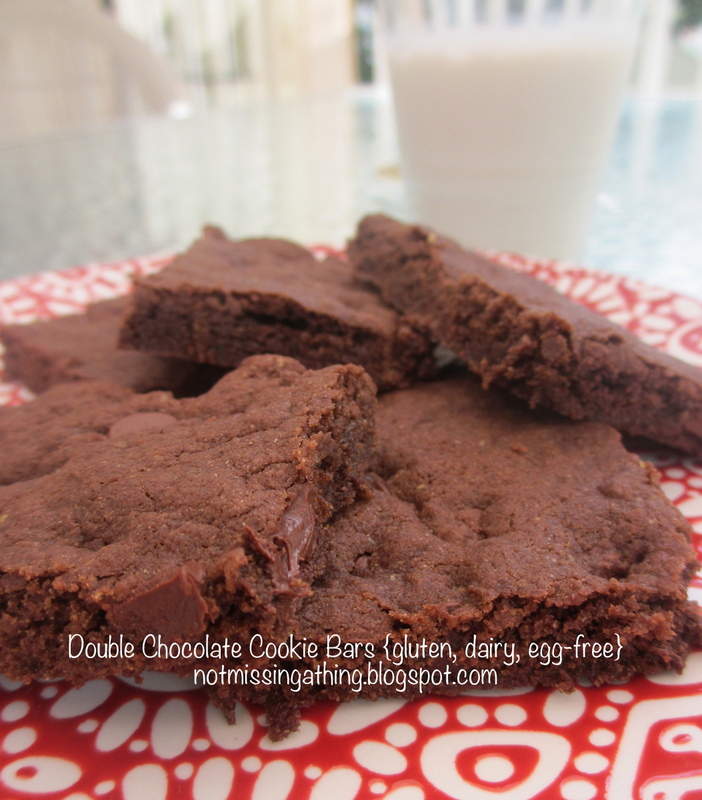 Double Chocolate Cookie Bars, sound delicious. Your recipe is awesome! Hope you have a great weekend and thanks for sharing with Full Plate Thursday. Oh my... this looks and sounds fabulous! Love all the chocolate. Thanks for sharing this recipe on foodie friday. Anything with chocolate is good. Double it? And it's extra good! Thanks for sharing at Foodtastic Friday! Thanks so much for your comment! Due to a high volume of spam, comments are being moderated. Your comment will appear as soon as it as been approved. Welcome! 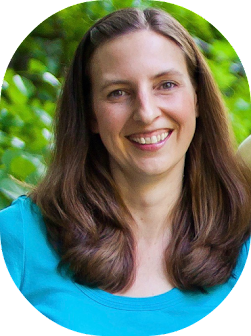 I'm Paige Forsyth and I have a passion for providing my family with wholesome, allergy-friendly foods, and for helping others do the same. I hope you will find some useful information and do-able recipes to help you in your journey of gluten, dairy and egg-free eating. And I hope, now and then, to point you to the true source of sustenance, Jesus Christ. If you've got a question or suggestion, email me . Copyright 2011-2013. All Rights Reserved.. Awesome Inc. theme. Powered by Blogger.